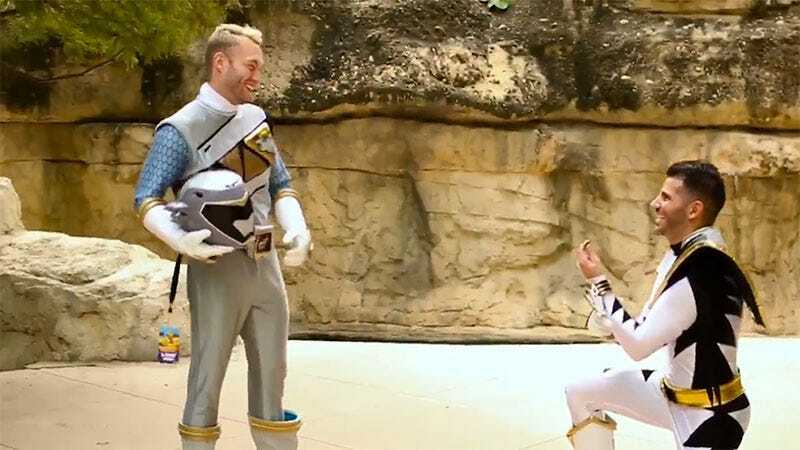 Cosplayers James Reese and Anthony Grillo were doing their thing the other day, shooting a very slick video with KevinTheDirector while dressed as Power Rangers, when Anthony had to go and ruin all those heroic poses by dropping to one knee and proposing. The proposal comes later in the vid, which is worth watching through not just for the life-changing personal circumstances, but for how many times these guys have cosplayed as different Power Rangers. Their wardrobes must be wall-to-wall jumpsuits. *wipes dust from eye* Maybe 2016 isn’t a complete wash after all.